Tropical Pineapple, Mango, and Coconut Fools..
Place pineapple and 1 tablespoon sugar in medium saucepan. Cook over medium heat, stirring occasionally, until fruit has softened and mixture becomes jammy, for about 15 minutes. If pineapple looks too dry during cooking, add a teaspoon of water at a time. Remove from heat and stir in lemon juice. Adjust to taste with sugar and lemon juice. Chill until completely cold before using, for about an hour. Using mixer fitted with whip attachment, whip cream on high speed to soft peaks. 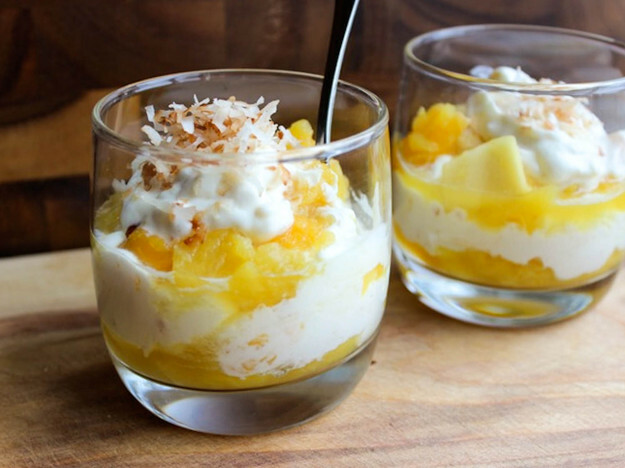 Fold in yogurt, pineapple mixture, and 1/2 of the coconut. And there you have a nice cool tropical dessert to try out over the weekend… Enjoy!! ← National Flip Flop Day! !